Ahi tuna and a London broil make the perfect toppers for entree sized salads. This week I asked my facebook friends to tell me what they wanted to see. I received a variety of great ideas and suggestions. One common theme from many folks was a desire for lighter meals for spring, seafood recipes and main course salads. So, by combining a few of those requests, I created these two entree salads, an ahi tuna with cabbage and carrots in a ginger vinaigrette and a London broil salad with tomatoes and beets in a blue cheese vinaigrette. Both are flavorful, loaded with fresh vegetables, and perfect for spring. Whisk together the first four ingredients in a medium sized bowl. If you have one large tuna steak, cut it into two rectangular pieces. Place tuna in a sealable bag and add marinade. Coat all sides of the tuna and then remove as much air as possible before sealing the bag. Let tuna marinate for 1 hour. Mix together toasted and black sesame seeds in a bowl. Remove tuna from marinade and shake off excess liquid. Place tuna in sesame seeds and coat all surfaces. Set aside. Heat grapeseed oil in a large pan over medium high heat. Once oil is hot, sear tuna on the top and bottom for 45 seconds and about 20-30 seconds on the sides. Remove from pan and tent with aluminum. Mix cabbages, carrots and lettuce in a large bowl. 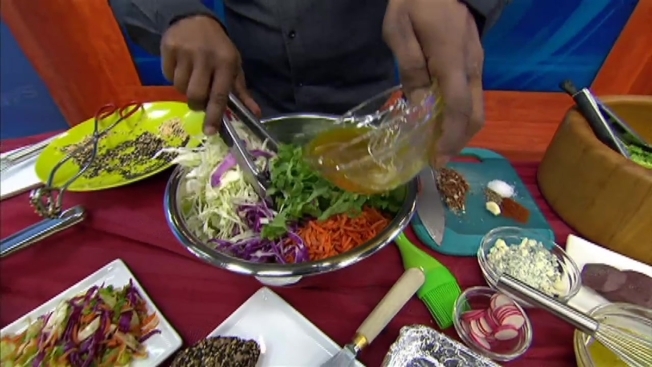 Make vinaigrette by mixing together ginger, soy, vinegar, salt, pepper and sesame oil in a bowl. Slowly whisk in Olive oil until fully emulsified. Pour dressing over cabbage mixture and toss to combine. Taste the salad and adjust seasonings to your preference. Divide salad among four serving plates. Top with edamame. Slice tuna and fan out equal portions on top of each salad. Peel beets and slice them into 1/2” slices. Bring about 1” of water to a simmer and place beets in a steamer basket over the water. Cover and steam for 20 minutes. Fill a large bowl with water and ice. After beets have steamed, transfer them to the ice water to stop the cooking. Set aside. Place salt, pepper, garlic and chili powder on a cutting board. Finely mince all ingredients together. Spread this mixture on the top and bottom of the top round. Cover with plastic and let steak rest for 30 minutes at room temperature. Mix together barbecue sauce and soy sauce and set aside. Preheat broiler. Remove steak from plastic and broil for 4 minutes per side for rare. Broilers vary greatly by oven and, depending on the actual thickness your steak, you may have to adjust this time. Remove steak from broiler and brush both sides with the barbecue sauce mixture. Loosely cover with aluminum and set aside. Mix together tomatoes, radishes and lettuce in a large bowl and set aside. Make vinaigrette by mixing together vinegar, sugar, Dijon, salt and pepper. Whisk in olive oil until fully emulsified. Add in blue cheese and mix until fully combined. Pour vinaigrette over lettuce and tomatoes and lightly toss. Drain beets and blot them dry on paper towels. Add them to the salad and give the mixture another quick toss. Divide the salad among four serving plates. Thinly slice the steak on an angle and fan out equal portions on top of each salad. For an added garnish, roll up two of the thin slices per serving and place these “roses” on top of each salad as well. Thanks again to all my facebook friends for their suggestions. I hope to share more of their ideas in the future. If you have any comments or questions, please send me an email at wayne@waynesweekend.com or join the discussion on Facebook or Twitter.